DrVoIP CISCO CIPTV2 CCNP Collaboration 300-075 Study notes! I found a few sites that are written by other engineers who are sharing their study notes as I am doing here. Both of these are excellent examples created by other Engineers who were also cramming for this test. In going through all the study materials, I noted my references and I offer them up here for others who may be following this path to certification. The questions represent practice tests from the above sources in which they all had different answers to the same question. 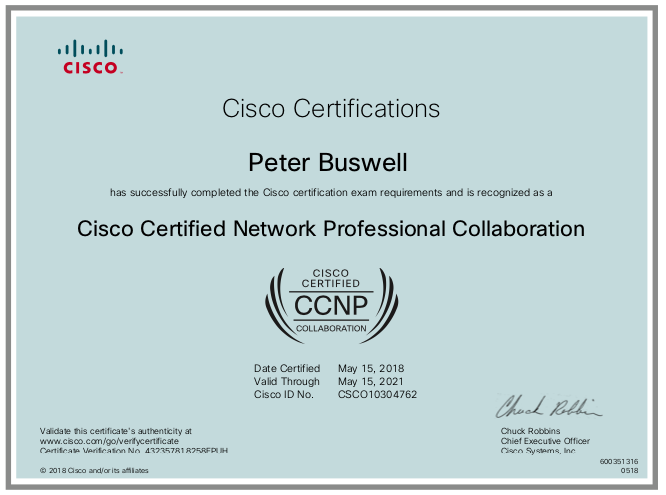 So in keeping with my commitment to actually learn and digest this material, I dug deep to find CISCO references to support the answers or to sort through the wrong answer and find the correct answer. As with all CISCO tests you need to carefully read the question and put the answers within the context of the subject they are asking about. Many times there will be two very good answers, but only one is the one CISCO wants you to select to get the points for a correct answer! 1 – The HQ Cisco Unified Communications Manager has been configured for end-to-end RSVP. The BR Cisco Unified Communications Manager has been configured for local RSVP. End-to-end RSVP configuration is available if the clusters are connected by a SIP trunk. End-to-end RSVP uses RSVP on the entire connection between the end points, and uses only one RSVP agent per cluster. where A specifies an endpoint in cluster 1, B specifies an endpoint in cluster 2, ICT1 and ICT2 specify the intercluster trunks within clusters 1 and 2, and the RSVP Agents associate with the respective end points. In this scenario, Cisco Unified Communications Manager establishes an end-to-end RSVP connection between agentA and agentB. From the RSVP Over SIP drop-down list, choose E2E. Set the Fall back to local RSVP field to your preference. From the SIP Rel1XX Options drop-down list, choose an option other than Disabled. 2 – Company X has deployed a VCS Control with a local zone and a traversal client zone. To facilitate external calls, VCS Expressway is deployed and traversal server zone is set up there. Video endpoints inside Company X have registered, but are unable to receive calls from outside endpoints. Which option could be the cause of this issue? Which Three Devices Support the SAF Call Control Discover Protocol? CUCM, CUBE, CME, IOS Gateway, CUCM CME are CCD SAF clients! 3 – Which two steps must you take when implementing TEHO in your environment? For SCCP phones: Use the show ephone registered command to display the status of registered SCCP phones. For SIP phones: Use the show voice register statistics command to display statistics associated with the registration event. Use this command to display all the SIP endpoints currently registered with the contact address. (When do calls on a VCS use a traversal call license? the Location Bandwidth Manager-OutOfResources counter is showing a positive value. For full details of how to create and configure subzones, and apply bandwidth limitations to subzones including the Default Subzone and Traversal Subzone, see the Bandwidth control section. In addition to bandwidth management, subzones are also used to control the VCS’s registration, authentication and media encryption policies. Manage bandwidth to restrict standard definition endpoints from using more than 2 Mb of bandwidth. “Subzones are used to control the bandwidth used by various parts of your network, and to control the VCS’s registration, authentication and media encryption policies”. 11 – A voice-mail product that supports only the G.711 codec is installed in headquarters. 14087071222 with number set to type international. The HQ_clng__pty_CSS contains the HQ_clng_pty__Pt partition. Which caller ID is displayed on the IP phone? 16 – An engineer must enable video desktop sharing between a Cisco Unified Communications Manager registered video endpoint and a Cisco VCS registered video endpoint. Which protocol must be enabled in SIP profile for VCS SIP trunk on Cisco Unified Communications Manager? At any rate, using Dumps is a high risk. At $300 US to take this exam, getting a “money back guarantee” on a $59 practice test is not very helpful. I passed the on the second attempt with an 860! I can assure you that more than 50% of the questions were NOT on any dump. Again the only real value in these dumps is to point you in a study area. Take every question and open a text book, or CISCO reference and make sure you really understand the subject matter. This is NOT an easy test, but if you study, you will pass it. Good Luck!